The Sesquicentennial Park near downtown Columbia features a very nice 4 miles long mountain bike trail that both beginners and seasoned bikers can equally enjoy. 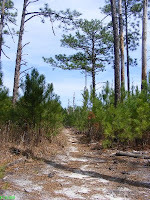 The serene, peaceful and mostly single track trail will take you through the park’s dense longleaf pine and turkey oak trees. 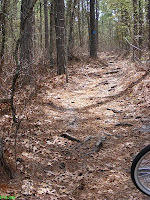 The trail has a sandy surface that sometimes is inches deep and makes the ride quite challenging even for more experienced bicyclists. If you go during the week there is hardly a soul around: just you, the bike and the forest. 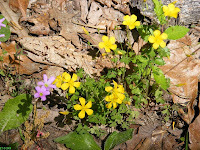 No matter the skill level, everyone will find something interesting along the trail: from wide smooth paths to rough root and stone covered patches to longleaf pine trees, so dense you can barely squeeze through, to desert like hills. 1. Play it safe. Wear your helmet and know your limits. When in doubt just carry the bike till you feel comfortable riding again. 2. Stay on trail and follow the signs. 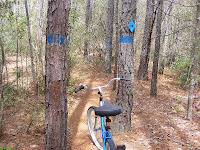 The mountain bike trail is marked with a blue diamond and between each marker you will see the trees painted blue. It’s very easy to get disoriented and at times you feel like you’re going in circles; just follow the signs and you’ll be OK. There are no maps along the trail to tell you where you are, how far you still have to go and what’s noteworthy to see in the surrounding areas. Pretty much you’re on your own. 3. This can be a great family weekend gateway. If you go alone tell someone when and where you are going. Bring your cell-phone; there is very good signal throughout the park. 4. Carry plenty of water since there is no drinking water along the trail; I didn’t see any water fountain at the park’s facilities. 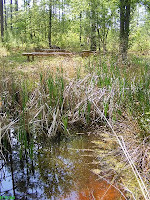 The restrooms by the picnic and boat area were closed during the week. Put on sunscreen and wear long sleeves it can get really hot out there. 5. It took me 2 hours to complete the trail. I’m a beginner and I also stopped frequently to take pictures. 6. Watch out for deep patches of sand especially when going downhill. You can easily lose control; keep the bike straight and break on smoothly, same as when you’re driving the car on icy roads. 7. Uphill roots provide good grasping for tires, yet avoid the bigger ones that can kill your momentum or worse make you tip over. 8. Besides some birds I didn’t run into any wildlife. 9. 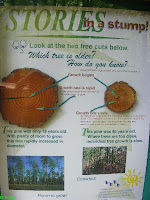 To find out what other activities you can enjoy at the Sesquicentennial park see my previous post. This is a great exercise that will you test you physically and mentally. You will enjoy fresh air and mountain like outdoors just minutes from the noisy downtown city traffic. All in all, biking at the Sesquicentennial Park it’s a guaranteed family fun activity. For only $2 per vehicle it qualifies for a “free thing to do” in Columbia. 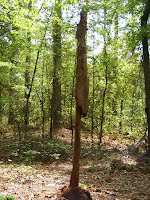 If you’re ready to take it to the next level test your skills and nerves on the Spider Woman II or Lost Creek trails in beautiful Harbison State Forest park also close to downtown Columbia. 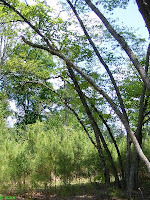 Keep on biking through beautiful South Carolina parks! Kids and parents come enjoy the mountain bike trail at the Sesquicentennial Park near downtown Columbia. The are 4 miles of outdoor beauty through an amazingly diverse terrain, from dense forests to desert like hills, from wide sandy paths to rocky curves that will challenge even the most experienced bikers. 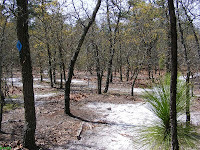 Get more information and tips from this post on the Sesquicentennial Park mountain bike trail. It’s fun, healthy, outdoor and practically free (only $2 per vehicle to enter the park). What else can you ask for? Bikers of all ages unite in beautiful South Carolina! Bet you can’t hold the hula that long! Kids and grown ups had a great time watching the show put on by Comedy Canines at The Palmetto Sportsmen’s Classic held March 28 – 30 on the state fairgrounds in Columbia South Carolina. Dog Lovers of the World Unite and Have Fun in South Carolina! Come outside, get some fresh air, enjoy the blooming trees and the migratory birds. 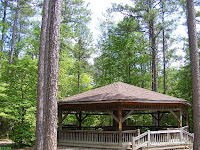 Riverfront Park is located in downtown Columbia minutes from State House and EdVenture museums. You can walk, jog, bike or skate for miles and miles by the peaceful Congaree river. For sportier types you can fish, canoe or kayak. Here are some 20 or so reasons to get off the couch! If you’re visiting this is your free afternoon spa! For moms with young kids there is a very nice playground at the park’s entrance. If time permits relive the history and be a proud South Carolinian at the magnificent SC State House. You can enjoy for free its fascinating history, outstanding architecture, remarkable sculptures, monuments and Revolutionary War paintings.